Marathon season. For some this means early morning boot camp M-W-F, an after-work run through the park T-Th, and the big weekend push to reach 5K, 10K, even 25K. A full fledged marathon is 26.2 miles or about 42.2K. So with eyes on that kind of prize, it takes some serious fuel to keep the body going. For others, marathon season means watching an entire season of TV in a row. You are having a lazy day and get hooked after watching the pilot. Rather than spend too much time preparing a meal, you’re looking for comfort food that can be prepared quickly and easily. No matter which kind of marathon you’ll participate in this fall, we’ve got a delicious line up of easy and flavorful meals that will keep your body fueled for miles, or cozy while you catch another episode. A delicious breakfast can make all the difference. Mom always said it was the most important meal of the day. And when it comes to fueling a workout or a run, she couldn’t have been more right. But don’t let us fool you into thinking these tasty meals have to be eaten in the early morning hours. Breakfast for dinner is both satisfying and delicious. Our delectable Ham and Swiss Breakfast Sandwich is filled with smoky, sweet DI LUSSO® Brown Sugar Ham and Baby Swiss Cheese. The contrast of the crunchy baguette and the smooth over easy egg mixes beautifully in your mouth. The fragrant basil leaves add a fresh and peppery flavor that compliments each ingredient and every bite. It’s hard to improve upon a classic ham and cheese, but this one looks and tastes like a winner. 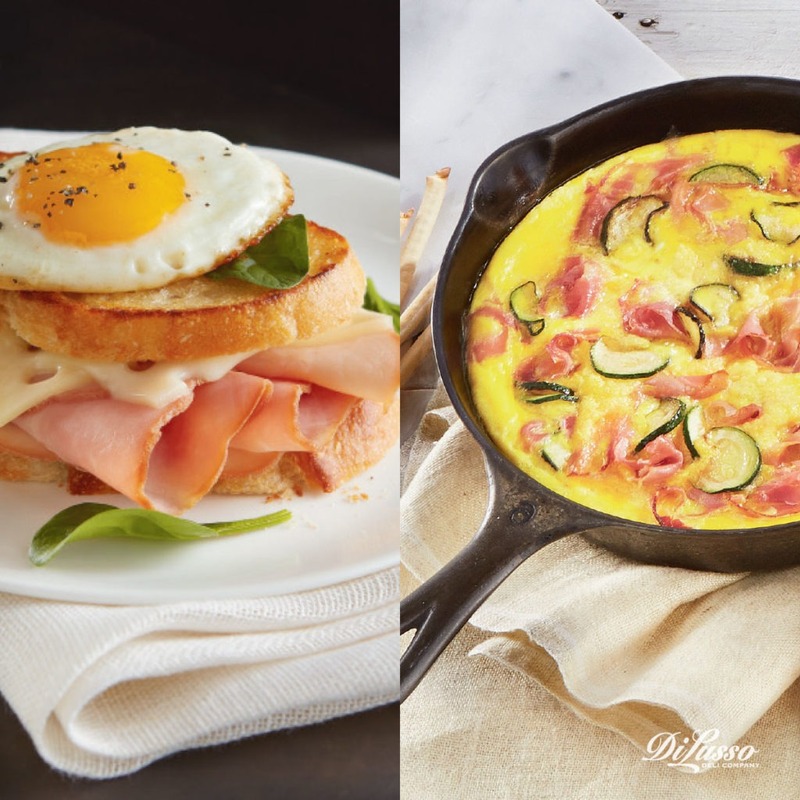 Brimming with flavor and high on protein, the Prosciutto and Zucchini Frittata is a mouth watering dish too tasty to reserve only for breakfast. Baked to perfection in an ovenproof skillet, it’s like a delicate quiche sans the crust. We’ve filled ours with fresh eggs, sliced zucchini, chopped fresh oregano and DI LUSSO® Prosciutto and Mozzarella Cheese. Served with a slice of sourdough toast and preserves, it’s a delicious brunch. But we love it for dinner too. A little side salad of fresh mixed greens with a light vinaigrette is a tangy and bright compliment to all those warm, rich flavors. Wrap up your workout with protein in a delicious hand held package. Make these up ahead of time and they’ll be waiting for you whenever you’re ready. It’s hard to beat the interesting and complex flavor combinations we enjoy so much in Thai food. A fragrant and flavorful mix of fresh herbs like cilantro and Thai basil paired with your favorite meats and the subtle crunch of fresh vegetables makes for a delicious start to a perfect meal. Our Thai Basil Wraps with DI LUSSO® Oven Roasted Chicken, a beautiful blend of all those fresh ingredients and the sweet heat of HOUSE OF TSANG® BANGKOK PADANG™ Peanut Sauce will make you fall in love with Thai all over again. 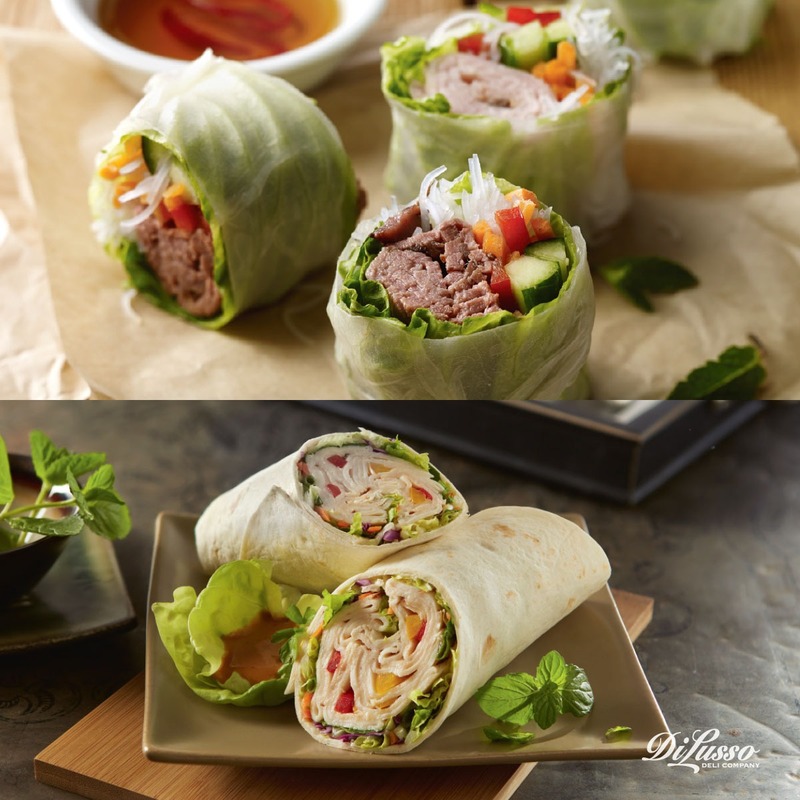 There’s truly no limit to the wonderful ingredients you can roll up rice paper wrappers. These Summer Roll Bites are small packages absolutely filled with flavor. We love pairing DI LUSSO® Seasoned Roast Beef and Oven Roasted Chicken Breast. The beef and chicken compliment each other and blend beautifully with the crisp, fresh flavors of cilantro, romaine, carrot, cucumber and red pepper. One of the tastiest parts of these bites is the sprig of fresh mint we’ve topped it with. It’s a cool, minty contrast to the savory meats and fills your mouth with fragrant flavor. Sweet chili sauce is a must for dipping. Make-ahead snacks mean more TV time, more deliciousness and less junk food. It’s OK, have at that bag of chips. We won’t tell. But when you see what we’ve got in store for your marathon menu, you’ll want to ‘train’ every weekend. 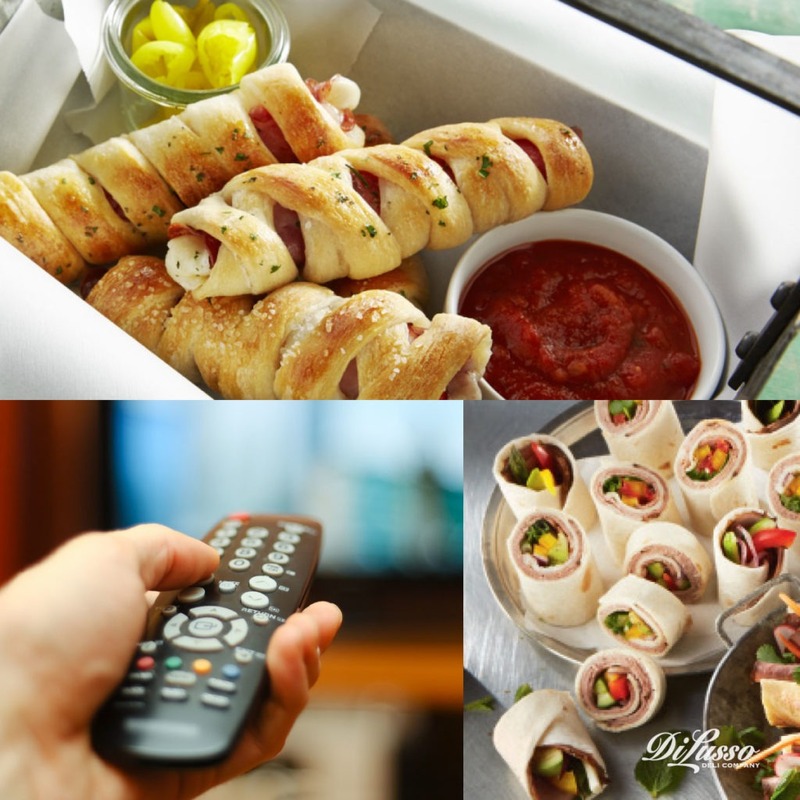 Fun to make and even more fun to eat, Stromboli Bread Sticks are as addictive as bingewatching. The crunchy-on-the-outside, warm-and-soft-on-the-inside breadstick dough spirals around a roll up of rich and flavorful DI LUSSO® Hard Salami or Italian Dry Salami, smooth and mild Provolone Cheese and Smoked Ham. They’re incredibly tasty on their own and even better dipped in marinara sauce. Roast Beef Appetizer Wraps are hearty and delicious as a snack or light meal. Horseradish compliments the flavor of the roast beef. The crunch and color of the vegetables add great texture and bite to the tortilla-wrapped treat. When you’re ready to come up for air and dinner, these favorites can be whipped up in less time than it takes for delivery. 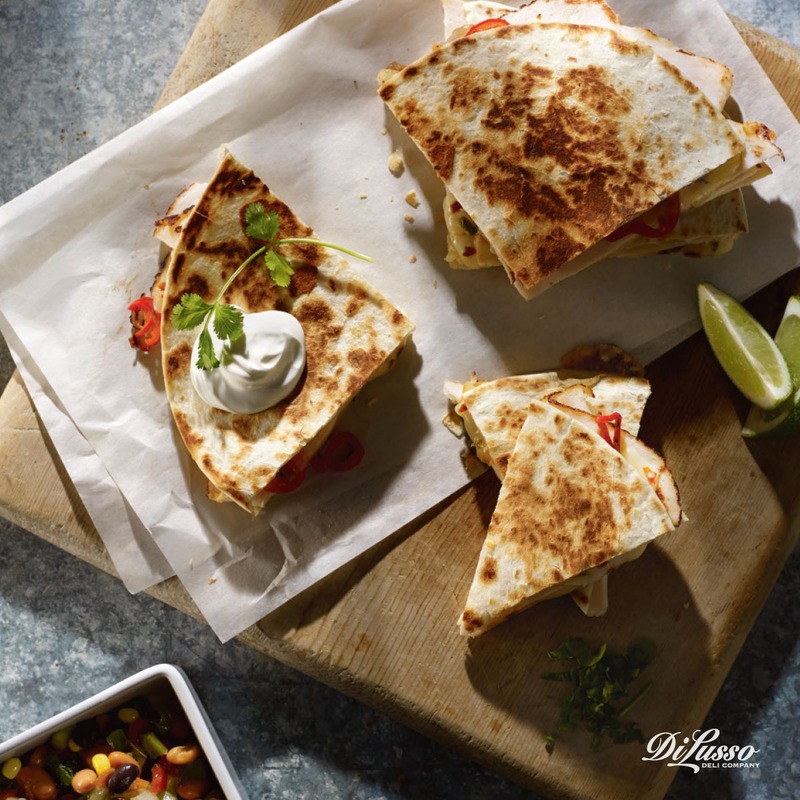 Moist and delicious DI LUSSO® Oven Roasted Chicken Breast, Habanero Jack Cheese and Roasted Red Pepper Strips are sandwiched between flour or whole wheat tortillas in our Chicken and Habanero Jack Quesadillas. There’s this wonderfully sweet taste that comes out when you heat a tortilla on a skillet. Crispy, delicate and light. It’s a perfect backdrop to the savory chicken breast, smoky-smooth red peppers and cheesy heat of the Habanero Jack. A spoon of sour cream and a sprig of cilantro on top will cool the heat with even more flavor. Dip in salsa and enjoy! At only 15 minutes to prep and 10 minutes to bake, you’ll be thinking twice about delivery. Just a little premade pizza crust, sauce and your imagination is all it takes. Our Pizza Alla Genoa is a feast of Italian flavors and so simple to put together. It’s topped with delectable DI LUSSO® Genoa Salami, Roasted Red Pepper Strips and Mozzarella Cheese Slices. The bold flavor of the salami is a perfect compliment to the mellow red pepper and mozzarella. We love topping it with a few tender artichoke hearts as well for an unexpected touch of sophistication and flavor and some sliced pepperoncini peppers for a subtle and sweet heat.